← CDFA Border Stations chipping in on invasive mussels prevention over holiday weekend. 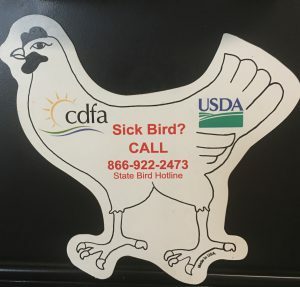 Bird owners in Southern California are responding to outreach provided over the past several days related to virulent Newcastle disease (VND), and have started reporting sick birds. VND has now been confirmed in a number of flocks of backyard birds in San Bernardino County. CDFA is working closely with USDA to respond to these findings, and is investigating any potential links between these cases and a case recently identified in Los Angeles County. Bird owners are urged to practice biosecurity to help protect their birds from VND and other infectious diseases. These include simple steps like washing hands and scrubbing boots before and after entering a poultry area; cleaning and disinfecting tires and equipment before moving them off the property; and isolating any birds returning from shows for 30 days before placing them with the rest of the flock. In addition to practicing good biosecurity, all bird owners should report sick birds or unusual bird deaths to California’s Sick Bird Hotline at 866-922-BIRD (2473). Thank you for the update! I would love to get a supply of the chicken “hotline” stickers pictures above to give out at my chicken 101 classes! Who do I contact to order them? Thanks so much! Newcastle disease is caused by virulent strains of Newcastle disease virus (NDV), which causes substantial morbidity and mortality events worldwide in poultry.